The primary focus of this technical note is to document the importance of adhesive selection, preparation and application to ensure strong bonding at the dolly-adhesive and coating-adhesive interfaces. The basic goal of adhesion testing is to produce a coating failure. The coating under test may experience an interface failure between the substrate and coating or between the individual coating layers in a multi-layer application. Coatings may also experience a cohesive failure within a particular layer. The ideal adhesive is one that provides a stronger bond at both the dolly to adhesive and adhesive to coating interfaces than the failure point of the coating under test. This ensures that all pull test results are valid and meaningful. It is also important that the adhesive be pre-tested on the coating to ensure that it does not produce a visible change in the properties of the coatings. Ideally this test should be conducted from the time the adhesive is fully mixed and applied to the coating until the adhesive is fully cured. Any change to the properties of the coatings could invalidate the results. Our lab tests have demonstrated that some aggressive adhesives will sufficiently weaken particular coatings, decreasing its bond strength. In one case, the adhesive appeared to react with the coating, increasing its bond strength after the new compound fully cured. Several experiments were conducted throughout the development cycle of the PosiTest Adhesion Tester. Some of these results and conclusions are referenced throughout this technical note. An additional experiment was developed and implemented to quantify these results and facilitate the writing of this article. Cure Times – The suggested Araldite 2011 cure time for most applications is 24 hours. One experiment involved pulling 24 dollies after 24 hours of cure time and an additional 24 dollies after a full 5 days of cure. The results were quite similar with an average adhesive bond failure at 2706 psi after 24 hours and 2729 psi after 5 days. This small increase is likely not statistically significant and helps demonstrate that the Araldite 2011 used was able to attain its maximum bond strength within the expected 24 hour window. Work life – Araldite 2011 has a 2 hour work life at room temperature which may help facilitate placing dollies on larger jobs. Cure Temperature – Araldite minimum cure times may be decreased from 15 hours to 5 minutes as the cure temperature increases from 68F to 302F. Caution: the application of heat may affect the coatings and their bonds to the substrate. Mix Ratio - Adherence to mix ratio between resin and hardener is important when mixing 2-part epoxies. 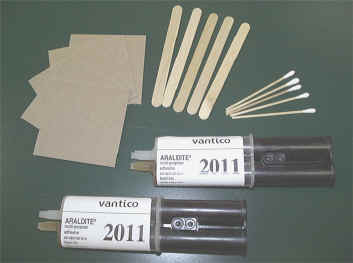 The single plunger built into the Araldite adhesive tubes is ideal for controlling mix ratios. The mixing process still requires the user’s care to ensure there are no blockages that can affect these quantities. It is also important to thoroughly mix the resin and hardener while avoiding air bubbles and impurities from the surrounding environment. Applied Epoxy Thickness - Per manufacturer instructions, the ideal application thickness for Araldite 2011 is 2 to 4 mils. The desired thickness can typically be attained by applying a generous amount of epoxy on the dolly surface. By spreading until smooth and even across the surface, then carefully placing the dolly on the surface and pushing straight down to squeeze out excess epoxy, the dolly will tend to self level in the target adhesive thickness range. Handling Strength – Araldite 2011 has a 7-hour wait until full handling strength has been reached – this may require dollies to be held to the coating using tape or similar material until partially cured. Epoxy Handling and Storage Information – material temperatures for mixing, storage temperature between use and shelf life are also important considerations when using Araldite adhesive. Whenever unexpected or premature failures occur, it is important to review the adhesive in use and its application process for changes. 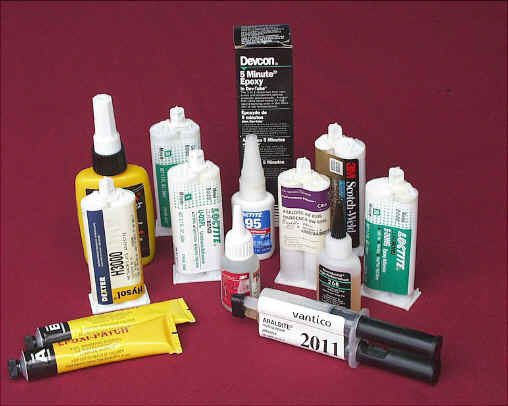 Independent of other aspects, the coating itself may be a deciding factor in adhesive selection. Various applications have been received through DeFelsko’s customer sample program. When testing one sample, a thin UV coating over clear polycarbonate, the Araldite epoxy was only able to achieve a 20% coating pull-off with an 80% adhesive-coating failure. The failure occurred around 400 psi. When the Araldite was substituted with a Loctite Glass Bonding adhesive the pull-off was the desired 100% with an expected strength of 600 psi. In another sample, a slick Teflon-like coating over aluminum, the Araldite epoxy and several other adhesives experienced 100% adhesive-coating failure at under 100 psi. The Loctite Glass Bonding adhesive was able to provide partial pull-offs at over 1500 psi, however the repeatability was not sufficient to recommend it directly. The recommendation to the user was to work with adhesive manufacturers to attain a more suitable alternative for the application. Many customers inquire about the use of Cyanoacrylates, which are one-part adhesives commonly referred to as “crazy glues”, in place of the provided two-part epoxy. Cyanoacrylates are best known for their faster cure times, ease of application, and relatively strong cohesive strengths. The biggest drawback is that they tend to experience adhesive failures at higher bond strengths at both the dolly-adhesive and coating-adhesive interfaces. They may still be acceptable and even preferred on specific low bond strength applications. It should be noted that even quick curing adhesives such as cyanoacrylates (working life measured in minutes versus hours) are subject to significant increases in bond strength as cure times are increased. In a well-documented Norwegian experiment,Ž 4 different cyanoacrylates all demonstrated significant increases in bond strengths as cure times were increased from 1 through 5 hours at room temperature. The increases ranged from 7 to 21%. In addition, the variation between results fore the cyanoacrylates tended to decrease as cure times increased. While Araldite 2011 is recommended as an industry accepted multi-purpose adhesive, it is up to the user to select an adhesive that best meets their application specific adhesion testing requirements. If the selected adhesive does not react to the coating, it is an acceptable choice so long as the majority of adhesion failures are limited to an individual coating layer, between coating layers, or between the coating and substrate.